Peppermint is a common herb used in candy, gum and toothpaste, as well as tea. Peppermint has several medicinal qualities. In addition to helping to calm anxiety, (mostly associated with other issues like depression), peppermint is also known to help relieve symptoms associated with the common cold, upset stomach, skin irritations, indigestion and headaches. To drink in a tea, combine 1 cup of boiling water and 1 teaspoon of dried peppermint leaves and let it steep for 10 minutes. You can drink peppermint tea about four or five times a day (between meals). However, it's a good idea to check with a doctor if you are pregnant or breastfeeding. A study in the Journal of Clinical Psychopharmacology shows that patients who received chamomile treatment experienced a significant change in the severity of Generalized Anxiety Disorder (GAD) symptoms. The herb has been used to calm nerves, decrease indigestion and calm the stomach. Steep 1 tablespoon of dried chamomile in a cup of boiling water, three times a day for about two months. Lemon balm has been used to help reduce stress and anxiety, as well as increase appetite, improve sleep, heal wounds, ease pain, treat stings and other insect bites. The herb is commonly combined with other herbs, such as chamomile, to help calm nerves. Steep about a quarter to 1 teaspoon of dried lemon balm in hot water up to four times a day. Passionflower has been used for many years to relieve anxiety, insomnia and stress. The herb is known to be as successful at treating Generalized Anxiety Disorder as the commonly prescribed medication Oxazepam. While there are side effects such as upset stomach, drowsiness and headache, these typically only occur if someone is allergic to passionflower or takes the herb in large doses. 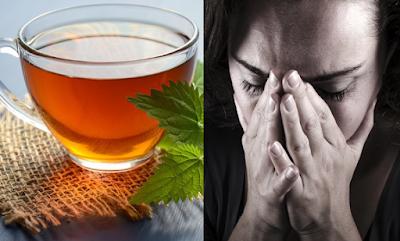 Overdosing can be avoided by drinking it in a tea. Combine 1 teaspoon of dried passionflower and 1 cup of boiling water. Research by the University of Maryland Medical Center shows that lavender's "calming, soothing, and sedative effects" can help treat insomnia, anxiety, depression, fatigue and agitation, among other ailments. Lavender incorporated into a massage can also help anxious people feel more positive and less anxious. You can drink the tea one to three times a day. Place 1 to 2 teasoons of the herb in a cup of hot water and let it sit for 10 to 15 minutes before drinking. Pregnant women or women who are breastfeeding should avoid consuming lavender.